1. Preheat the oven to 160 degC. Place 12 paper baking cases in a muffin tin. 2. In a medium bowl set over a pan of simmering water, melt the chocolate and butter together, stirring well. Leave to cool a little. 4. Spoon the mixture into the cases and bake for 20 minutes. 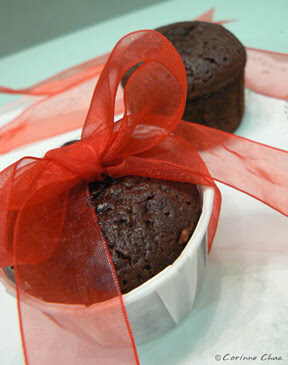 The cupcakes will be soft and gooey in texture and appeareance. Remove tin from oven and cool for 5 minutes. 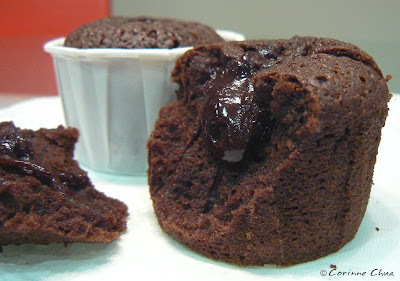 Then remove the cupcakes and serve swiftly, dusted with cocoa powder. Looks great. You should post the recipe.